The webOS is newer concept in web application domain. The concept is pretty simple of making browsers more capable, taking a step forward from Web 2.0. 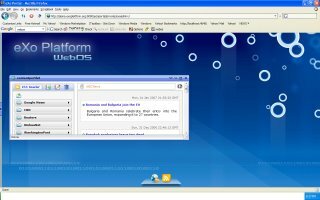 WebOS is a virtual operating system that runs in your web browser. Here is one of the article I found giving a comparison of latest WebOS present in market. I am not going to discuss further about webOS in this article. There has been a hype in market about Google Browser, Google coming out with similar GoogleOS. We have to wait and see when that happens. In this article, I want to bring in light how useful webOS can be for Portals. Portal already provides the features such as SSO, Authentication, Personalization, Customization and so on. With the help of WebOS the portal can act like a virtual desktop for a person. A person can access it from anywhere from any machine on any OS. He will get all the functionality right in one browser. eXo Portal, one of the leading open source portal, have come up with webOS implementation on Portals. eXo WebOS is coming out with desktop theme of Mac OS, Vista Theme. There is also a demo link.